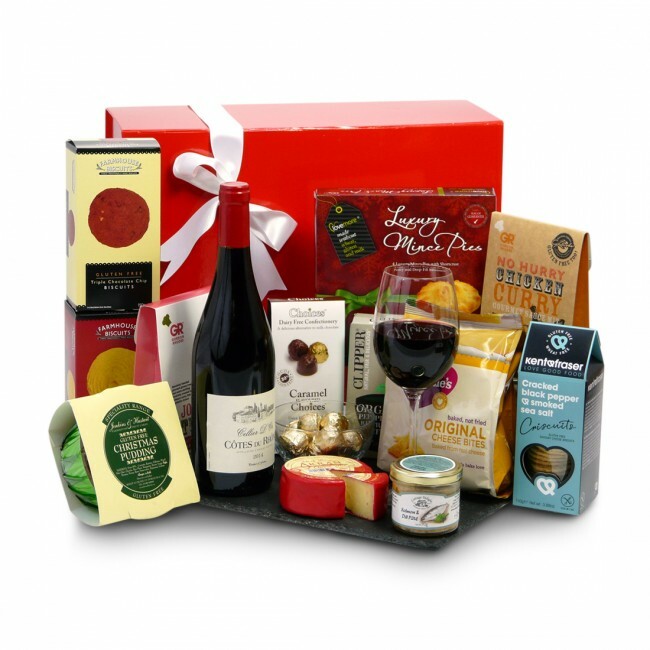 Celebrate Christmas with family and friends with a Delights Box containing festive treats especially chosen for anyone following a gluten free diet. Inside you’ll find the ingredients for Christmas Day including Christmas pudding carefully hand packed alongside deep filled mince pies, buttery vanilla shortbread, decadent brandy butter and triple chocolate cookies. Don’t forget the gluten free sage and onion stuffing. Enjoy oak smoked cheddar cheese , crunchy veggie crisps, salmon pate and savoury biscuits served with a full-bodied red wine and there are other treats too. Please scroll down for a complete list of the gluten free food and drink in this hamper.